The new Sanctions and Anti-Money Laundering Act, which received Royal Assent earlier this year, provides the U.K. powers to impose, update, and lift sanctions and AML regimes after the U.K. leaves the E.U. in March 2019. But will the U.K. sanctions landscape stay the same, or is it likely to change drastically? 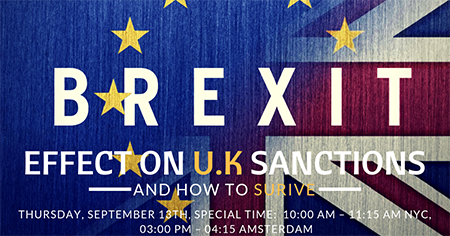 What the effects of Brexit will be on U.K. Sanctions Law and how compliance officers can best prepare for the switch. Susan Lake is Regional Compliance Head for Europe, Middle East and Africa for Swiss Re’s Reinsurance Business Unit. She has been with Swiss Re in various Compliance roles since 2005. Before that, she worked for over 18 years in the Lloyd’s market, in a range of roles including marine underwriting, business planning, business transfers, liaison with capital providers and rating agencies, syndicate monitoring and compliance. 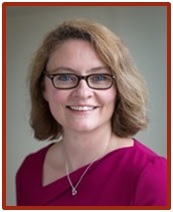 She has worked in the London insurance market since 1986, and is a Fellow of the Chartered Insurance Institute. SanctionsAlert.com typically requests CAMS (Certified Anti-Money Laundering Specialist – ACAMS) and CAFP (Certified Anti-Money Laundering and Fraud Professional -ICB) credits for its live webinars. Please send us a message if you wish to confirm which credits have been obtained.